What would happen if we treated sidewalks like streets? The City should treat sidewalks like streets. That is, the City should “plow” the sidewalks rather than relying on individual property owners’ initiative to shovel the snow. Why have property owners do the work of maintaining public property? The only benefits I can identify are (1) heart-warming stories of neighborly generosity where people clear the snow from elderly neighbors sidewalks, cookies are baked for the nice folks shoveling their friends’ walkways, and the camaraderie as we get to know each other as we share the burden, and (2) the City (that is, taxpayers) don’t have to pay for it. Yet we do pay for it with our time, money (snowblowers are not cheap and even snow shovels cost something), and limitations in transportation choice. Why have the City clear the sidewalks? I believe Northfield could find ways to manage both the cost and logistics (perhaps a snow removal utility – rates would be higher if you live on a cul de sac, but lower on a snow emergency route), so that’s not my central concern. Sidewalks are critical public transportation infrastructure, not amenities. Whether we cannot drive, cannot afford to drive or choose to walk to carry out our daily activities, we rely on a safe sidewalk network to get around just as much as others rely on the motor vehicle spaces. City maintenance of the sidewalks network (and filling in gaps in the network) would be a strong statement of the importance of transportation choice and do much to implement our environmental, age-friendly, multi-modal transportation policies. Piecemeal snow removal on sidewalks limits mobility and increases risk for everyone, but particularly older adults. Reading comments on the Age-Friendly Northfield survey recently, snow on sidewalks was mentioned by multiple people as an obstacle to getting around as they age. Snow removal is one of the biggest objections to adding new sidewalk. Attend any public meeting for a street project where sidewalk is proposed to be built where none currently exists and you’ll hear a concern about the burden of snow removal. Since snow is a problem for less (often much less) than half the year, this means fear of snow shoveling has helped create gaps in the sidewalk network itself which persist year-round. Northfield could remove this excuse my removing the snow. 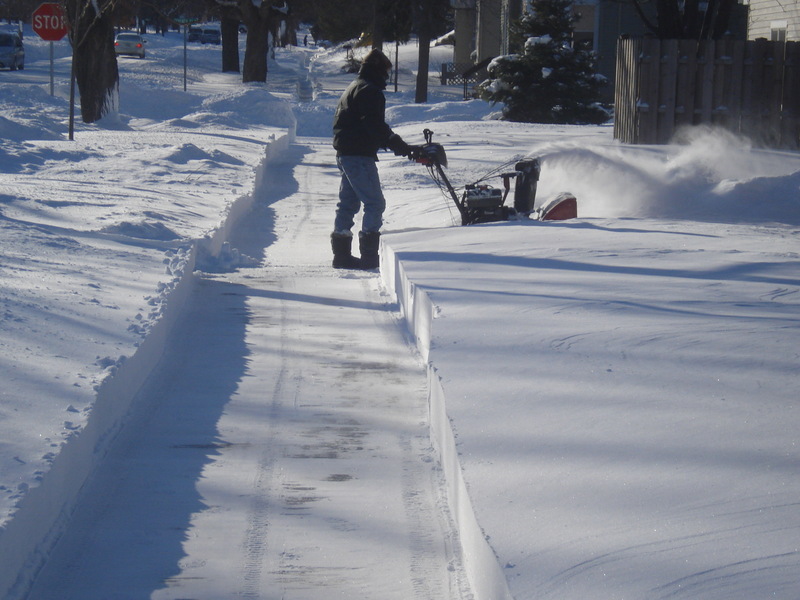 Snow removal by property owners is not always equitable. In areas with neighborhood associations, the association removes the snow. In others, like mine, my family can buy a big and expensive snowblower; my neighbor can pay for a snow removal service. The rental properties in my neighborhood are rarely shoveled and neighbors who work out of town (or work long hours) often do not have time to clear the snow promptly or effectively. Any one of the properties which doesn’t clear the sidewalk interrupts the network for the block. Maintaining a transportation network should not depend on individuals’ affluence, work schedule, means of paying for housing, or sense of civic responsibility. Wait, would the City have to clear all the sidewalks at once? No, the City could prioritize sidewalks the same way it does streets as long as it provides a connected, clear sidewalk network in a timely manner (here’s a similar argument for bike lanes). My local street is appropriately plowed later than nearby collectors; my sidewalk can wait, too. 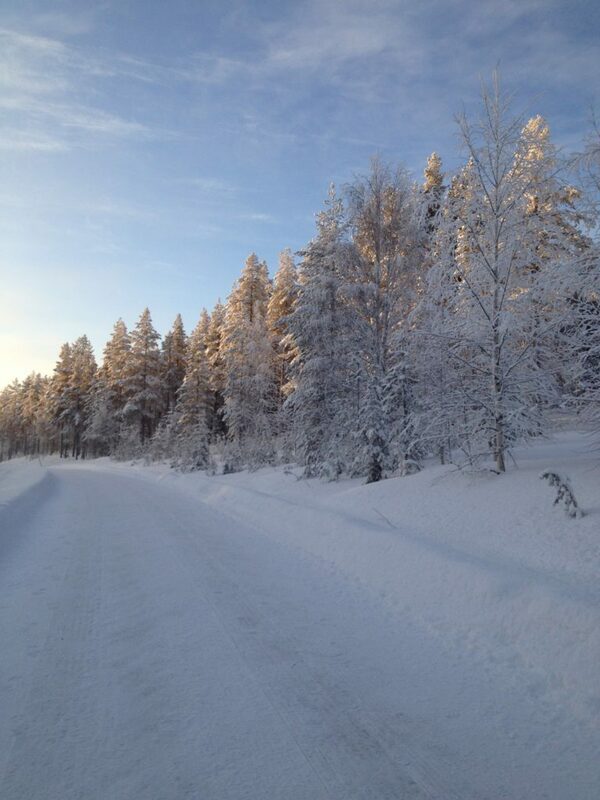 Some special cases might include ensuring snow is removed quickly near schools and facilities serving older adults. What about sidewalk maintenance more generally? The City is will discuss its Pavement Management Index on Tuesday which maps the condition of driving surfaces of City streets. If the City treated sidewalks as transportation infrastructure, sidewalks (and gaps in sidewalks) would be included in their inventory. Marvin Lane is just one-block long, but it is one block in an important location in Northfield. Marvin Lane connects Washington Street and east side neighborhoods to Division Street/MN 246 and schools, downtown, and out of town. Marvin Lane is one block just at the point where the traditional street grid breaks down in favor of cul de sacs and dead end streets which make it an important connection between major north-south routes is particularly important for people choosing to walk or bicycle because of the lack of alternative routes and the poor sight lines for other streets to cross Division Street. 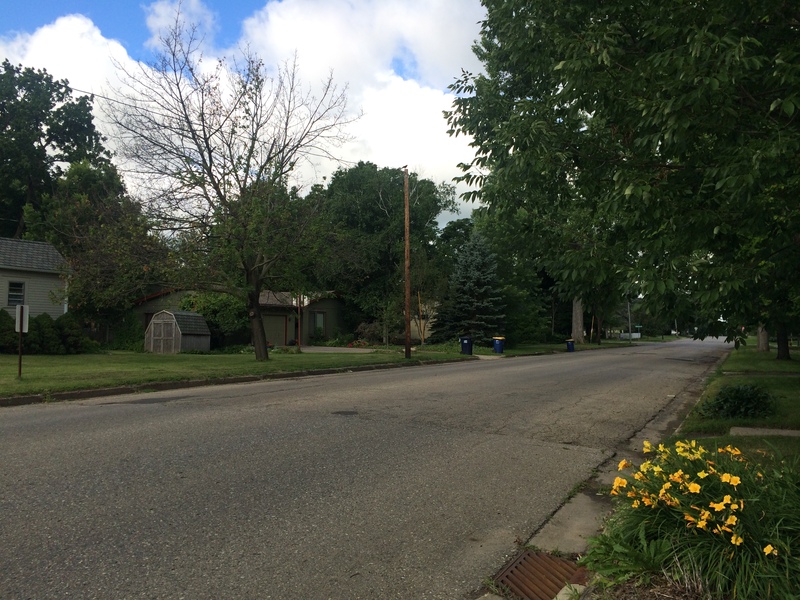 Right now, Marvin Lane is a 36′ wide street with 9 driveways, mature trees and no sidewalk. Marvin’s pavement is in such poor condition it’s almost a gravel road again, so its place on the 2017 reclamation list is overdue. The City Council held an improvement hearing two weeks ago to consider the list of 2017 reclamation projects. The Council was enthusiastic about adding the staff-recommended sidewalks to the Nevada/9th Street/Maple curve and asked about taking similar action on Marvin Lane despite the original staff recommendation not to add sidewalks to Marvin. Staff is bringing the issue back on Tuesday, February 21, asking for the Council to pass a Motion directing staff to update the 2017 Feasibility Report (all steps in the so-called 429 Process required to be able to use special assessments to fund part of the project) to incorporate sidewalk on Marvin Lane (The motion to update requires a simple majority; ordering the improvement will require 6/7 votes – an issue in previous sidewalk decisions). Staff recommends adding the sidewalk on the south side of Marvin Lane and narrowing the street from 36′ to 32′ wide; this is a much better plan than originally offered. Moving curbs at all during street reclamation to help build better facilities for people choosing to bike or walk is a big step for Northfield and the outcome would be a street which is somewhat skinnier which could help slow traffic while making room for sidewalk on one side and preserving trees. The south-side sidewalk could then connect to future sidewalks on Division Street (and perhaps farther future sidewalks on Washington, Sumner and other points east). I’d like to applaud the willingness of staff to bring these types of changes to the Council and thank Council for asking for these steps. (1) Forget sidewalks, how about shared space? The initial staff report stated “the width of this street provides for both a mixed use of vehicles and pedestrians and sidewalks are not recommended.“ I think this means staff envisioned people walking in the roadway because traffic volumes are low and there is plenty of space for cars to pass anyone on foot or bicycle. But for people to be able to safely and comfortably walk in the same space as motor vehicles, vehicle traffic must be moving very slowly and which would be unlikely given such a wide pavement surface. 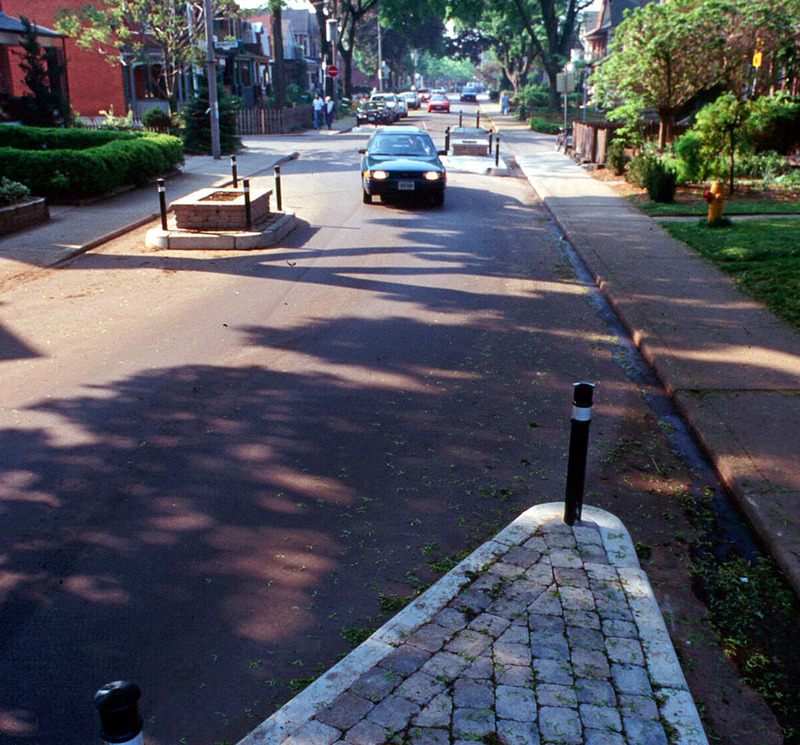 Narrow the street width for the length of the block, or consider chicanes or other measures to calm traffic, encourage users to pay attention, and create places for additional trees (and rain gardens and other stormwater management)public improvements. (2) Reallocating space to separate rather than share uses: 32 feet wide is still very wide with (thinking of motor vehicles only) space for two 12′ travel lanes and and 8′ parking lane (or two 11′ travel lanes and a 10′ parking lane) in addition to the one-side sidewalk recommended by City staff. For a one block connection where traffic should be slow and we’re prioritizing the walking and biking possibilities), how could the right of way be allocated differently to slow traffic and add space for people walking and biking? Make the street skinnier to allow one (yes, just one) travel lane plus queueing areas/passing places for oncoming traffic and sidewalks on both sides. Or with two-way traffic, add neckdowns to slow traffic by creating a place where on-coming traffic must give way (but still let people to ride bikes through). Put sidewalks on both sides: two (more than wide enough) 10′ travel lanes use up just 20′ of pavement which would seem to allow more than sufficient right of way to add sidewalks on both sides of the street. Bike boulevard: For such a low volume, low speed link, separate bike lanes are less necessary even for young or inexperienced riders (I’d say bike lanes might make sense to connect to other bike lanes in the future, like on Division Street or Woodley Street?) as part of the network. 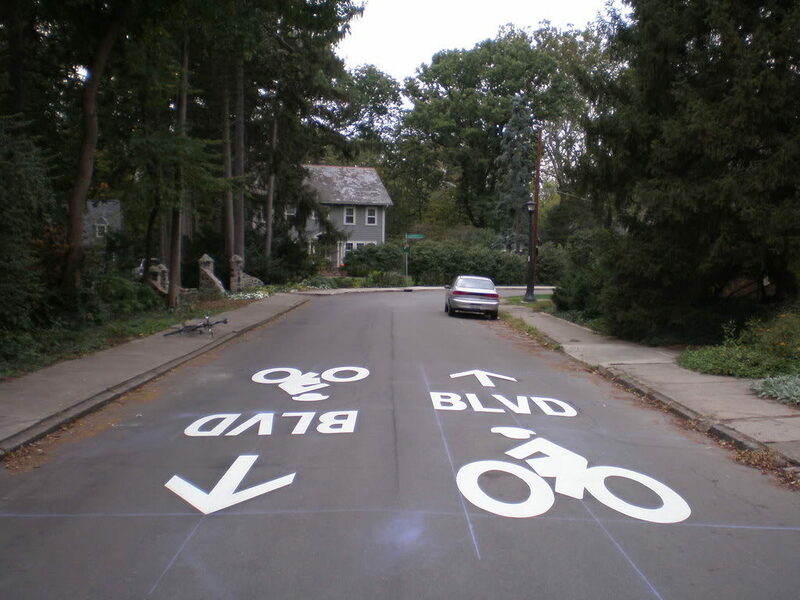 But a bike boulevard would highlight the intention to prioritize people on bikes, add signage (like sharrows and street signs), and make Marvin Lane part of the bike route planning (that’s the hope anyway). (3) Connections are critical: Decisions are usually made one project at a time which can lead to discontinuous and unconnected links rather than a network. Marvin Lane is, by itself, one block with low traffic volumes. Taken in context, however, Marvin is the first link north of Jefferson Parkway between Division Street and points east (with a cemetery, church and housing on non-continuous street in between), the street with the best sight lines for crossing Division Street, and a very useful connection to reach the High School, Sibley School, Senior Center, soon-to-be-improved 246/Jefferson area. If this block is redesigned for biking and walking now, it sets up future improvements for walking, biking and connectivity. “How we put together the built environment within our public right-of-way determines much about how we can conduct daily life for years to come.” I can’t get this quote from civil engineer and bike advocate Fionnuala Quinn neatly out of my mind because it so eloquently captures the long-term significance of street projects for a community. 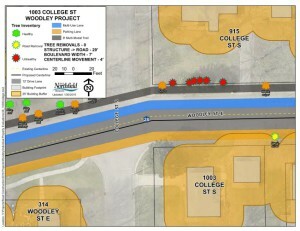 As the Woodley Street project progresses, public meetings are now scheduled – the first meeting is tonight – so this is the time to think together about how we would like to be able to conduct our daily life along and across this corridor and move the conversation from costs (or perceived costs) to shared benefits. Typically, street projects are designed by consultant engineers – Bolton and Menk, in this case – with limited knowledge of the community context of the street. While Bolton and Menk have worked in Northfield frequently, that’s not the same as knowing how the street and surrounding land uses work together, or how Woodley connects more distant parts of the city. Community members, both those adjacent to project boundaries and those who travel through the project area, can inform the non-native designers about the community, how this street connects to other places (or how it doesn’t now, but could in the future), and other local knowledge about the place and how people move around in it. In other words, showing the engineers what matters in human terms so the design can respond to local context rather than just slapping down the standard plate over whatever might be it its path. It’s no secret I’m interested in broadening the conversation and changing the street to do more and to change the way the space functions for the longer term. 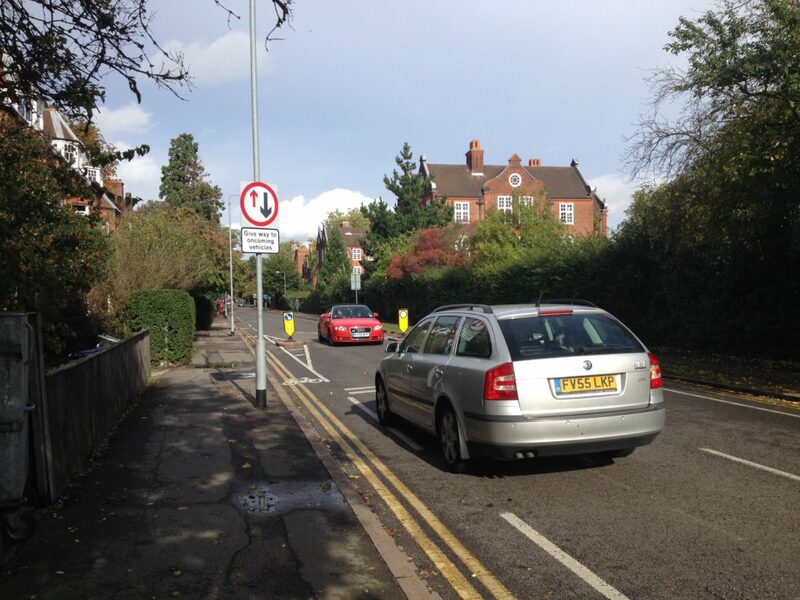 Northfield and its hired help need input from the people who currently use or cross Woodley Street and those who avoid it because of perceived problems to determine what change is needed. I’m also a design idealist (despite believing this video to be all too true). Having had the luxury of living in and visiting other cities, I have seen how well-designed infrastructure makes getting around easy and pleasant as well as experiencing less than well-designed places and struggling as a result. Local people know their places well, but are not street design experts and rather than asking residents (or the City Council) to be citizen engineers and do the drawing, I’m wishing for local people who provide great feet-on-the-street knowledge and innovative designers who can create a street corridor which works for Northfield. Northfield has made great progress in the last few years publicizing meetings, providing on-line engagement, and increasing the number of face-to-face opportunities for input. Even so, it is difficult to reach and engage community members beyond the adjacent property owners for whom personal notice is built into the legal requirements. BikeNorthfield (I’m on the its steering committee) and other organizations like Sibley School and the school district, advocates for public health, etc. can help spread the word that input is needed about the project (and we should get to work). Not that the adjacent property owners should be ignored; I appreciate the very real concerns (and have paid my own special assessment in the last few years) – project residents mostly own their homes and their home is likely a very substantial portion of their assets – of course they are concerned about the impact to that asset and whether the project will affect its value or their ability to enjoy their property. The way we assess a portion of the project cost to adjacent property owners makes it completely reasonable that they may have an aversion to loss of “their” property when a sidewalk is constructed or fear how any change in the street corridor will affect their investment. On the other hand, Council members who simply give residents veto power abdicate their responsibility to consider the long term benefits for the community. Perhaps my biggest concern is how little education takes place to guide public comment. Most of us do not spend much time looking at street cross sections, learning about intersection geometry, or know what design features have been demonstrated to calm traffic, improve safety or address other relevant issues (hence my comments above that residents supply context so thoughtful designers can get to work). In the past, consultants and staff have done little to help policy-makers or residents learn what design choices are possible, how design could help solve problems identified, and what choices cost in both the long and short term, but instead stood by their diagrams and maps waiting for whatever questions or comments emerge. If we’re simply shown big diagrams and asked “So, what do you think?” or “Do you like it or not?” we don’t know much about what we’re being asked and are more likely to give feedback which is irrelevant (when I scribble “Make Woodley a 32′ wide street!” when the 44′ width has already been decided) or merely reactive (“I don’t want a sidewalk!”). 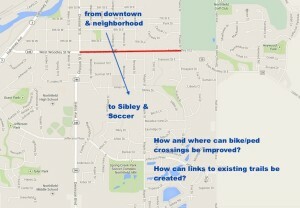 What if we framed the discussion this way: The City is working to implement its Safe Routes to School plan and make its streets more “complete” by improving bike and pedestrian connections to important destinations like Sibley School, the Spring Creek Soccer Complex, the City Pool at Old Memorial Park and downtown. 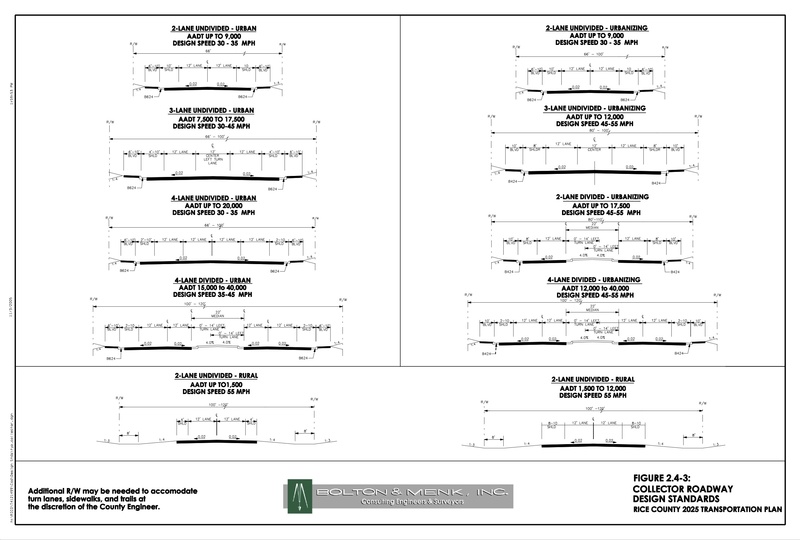 The County requires a 44′ wide street with 12′ travel lanes. 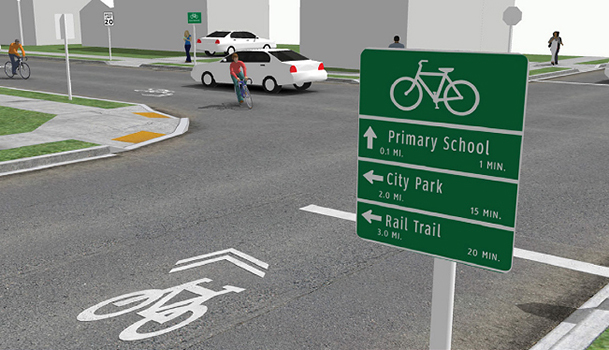 The remaining space can be allocated in different ways to provide better bike connections, prioritize private parking, or a combination of uses. Sidewalks are included in Northfield’s policies, too, and can be included in this project. Then, the City could present some alternative configurations with some of the benefits and costs of each. Hennepin County has recently been doing some planning and adding bike lanes on Lowry Avenue. 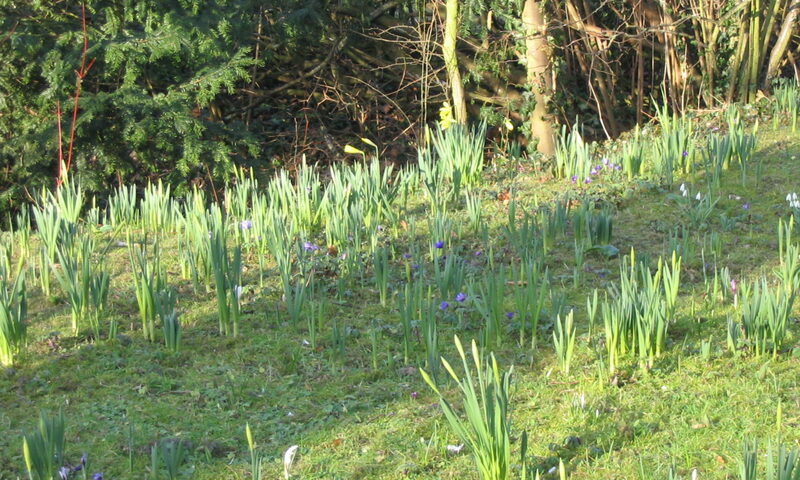 In addition to the flat images, the County has tried to market the change positively. 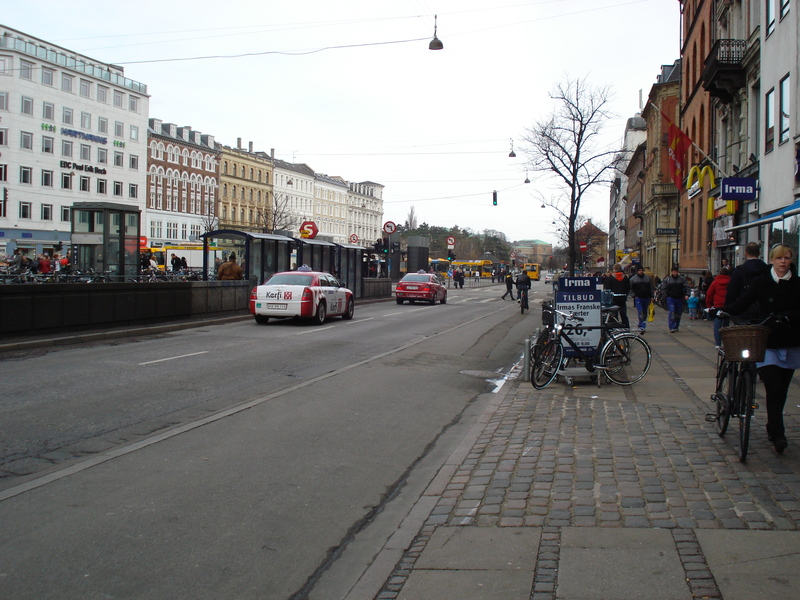 The image shows cars still moving efficiently, but also includes the bikes and new trees to present a positive image of change rather than a documentation of loss. What is the broader benefit or how do we change? City staff and elected leaders could emphasize values and priorities as articulated in city policy. Our policies are really good and forward thinking. Allocating space for bicycles is less about space than about making different choices (and allocating all the space for cars was a choice made in the past). If we presume the space is for motor vehicles, then every reduction in driving or parking space seems like a loss or (worse) a threat. If, on the other hand, we start from the position than the public right of way should be allocated for the broadest inclusion and choice across the network, we can use the space to both permit safe, uninterrupted vehicle movement and safe, clearly identified space for bicycles. Woodley Street needs fixing as anyone who has driven, ridden or walked on it knows. But remembering this needed repair to pavement and pipes is a once-in-a-generation opportunity for change, what are the other benefits the city could realize? My interest is how Woodley Street helps us get places and links destinations – and it is a key link to many places in Northfield. If Northfield and Rice County rebuild Woodley Street by repeating choices of the past – a car-only county highway without sidewalks, safe intersections for pedestrians, or bike facilities, the City will miss the chance to help anyone who walks, bicycles or uses a wheelchair/scooter right now to reach downtown, parks, schools and moving around the neighborhood and, more importantly, will preempt these choices for decades more to come. 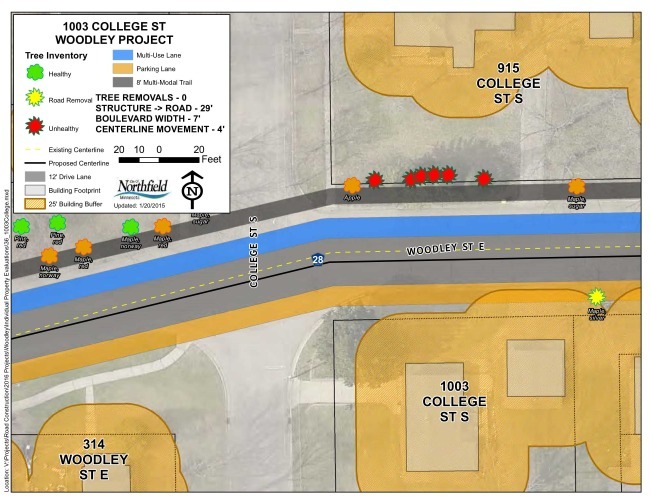 Northfield’s City Council is getting ready to discuss Woodley Street’s sidewalks on October 28. If this work session conversation follows the well-worn path of earlier sidewalk and street improvement projects, it will go something like this: progressive Council members who consider projects in the context of Northfield’s adopted policy (Comprehensive Plan, Safe Routes to School, Complete Streets), support building transportation equity into the system, and generally look for long-term, high return on investment solutions will support sidewalks noting the importance of the corridor for schools, parks, and downtown. The others will respond to the project in isolation, highlight the shortest term bottom line, question the need for sidewalks, and respond immediately to NIMFYs. Sidewalks have become the litmus test which reveal the Council’s and individual Council members’ priorities and values rather starkly. Rice County encourages sidewalks (and trails and earthen berms) along minor arterials like Woodley Street (although classified as a minor arterial, the current design of Woodley Street more closely matches the standards for major collectors), but requires they be placed outside boulevards which demands an additional 10-16’ of ROW for 5-8’ sidewalks. 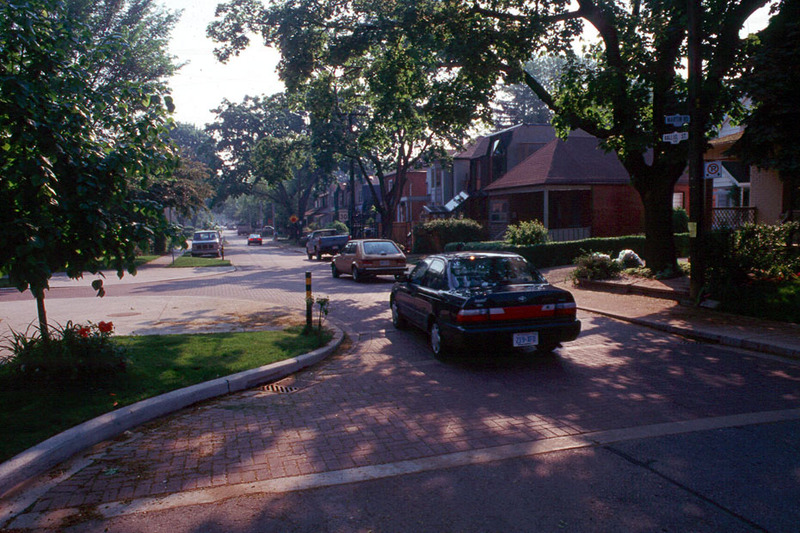 For Woodley, which functions as a local street with driveways, homes fronting the length of this segment, and multiple intersections, and its context which connects schools, homes, downtown and more. constrained by the homes on either side, this is not very encouraging at all. Northfield, in its Comprehensive Plan, calls for 10-12’ travel lanes with an assortment of other requirements for parking, sidewalks, bike lanes, and boulevards depending on how we classify the street. The policy guidance could be seen as more encouraging – narrower lanes, variable shoulder/parking requirements etc. appear possible – but also less clear. Northfield’s Complete Streets guidance to narrow lane widths as part of developing better pedestrian and bicycle infrastructure also gestures in the right direction, but does not require action. 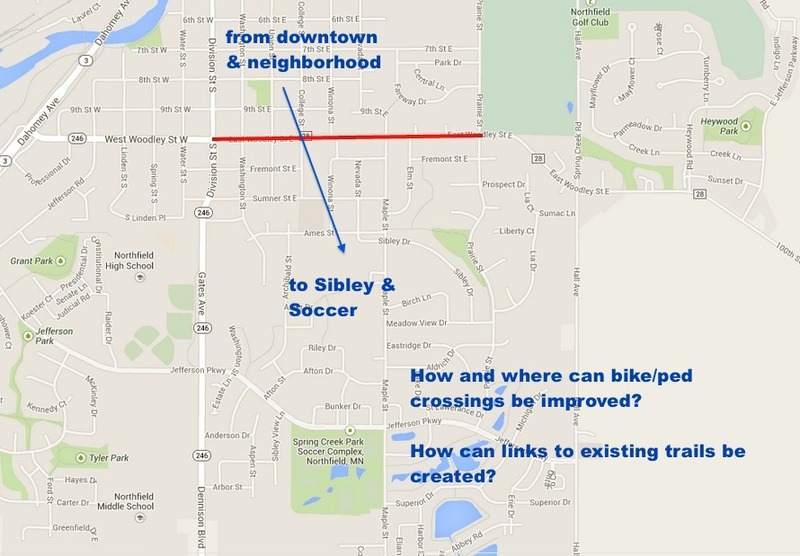 So we could make “more” space by shrinking travel lanes if Rice County could be convinced to consider design changes, and help solve some of the issues noted earlier – shrinking crossing distance for pedestrians and building more function and value into this corridor. “Safe” has become one of those red-flag words for me. When someone on either side of a debate uses the “S” word, it’s intended to stop debate because no one can argue against safety, can they? But what is really safer (and supported by relevant data)? Jeff Speck’s piece lined up the literature showing narrower lanes are often safer, rather than the reverse, in urban settings. Woodley Street serves as a local street with driveways, regular intersections, etc. but it is also a County road intended to move traffic through town. For a rural County road between, say, Northfield and Faribault through agricultural land, the transportation and access needs are rather different from a street through the Urban Core and the design should shift accordingly. Narrowing travel lanes (and perhaps the shoulder) on Woodley Street would help cue drivers they had left the wide open rural roadway and should slow down, look for entering and existing traffic, pay attention to intersections and consider non-motorized transportation. Safety could be enhanced, rather than the opposite. If there’s space and it’s safe, we can still argue about cost. In Rice County, the city bears most of the cost of building (and all the cost of maintaining) sidewalks since these are (quite properly) a city need and the city gets the benefits, too. So, yes, sidewalks will cost some money, but what offsetting savings could there be? Narrower pavement saves money on the paving (initially, and when maintenance is required), reduces stormwater runoff, improves safety by slowing traffic and reducing crossing distances (especially in a corridor with limited sight distances for pedestrians like Woodley’s Death Curve), promotes active transportation and public health and increasing transportation options. Northfield’s Complete Streets policy explicitly calls out the intent to realize long-term savings on the triple bottom line to offset higher short-term costs. Really, the issue is not so much a question of space as priorities. County roads allocate space exclusively to motorized traffic; this is not unreasonable for roads with limited access to property and few intersections intended to move vehicles, including large farm equipment, between cities at high speeds. City streets – or county roads in the urban core – have also allocated almost all their space to motorized traffic, too, with 12’ lane widths and inconsistent sidewalks. Northfield has waved its policy-making hands at shifting priorities, so at the safe distance of a Comprehensive Plan and Complete Streets policy, sidewalks and non-motorized transportation are important and should be improved, but fall by the wayside when particular projects are on the table. For both County and City, there has been willingness and eagerness to fund “soft” improvements like the Bikable Community Workshop and bicycle safety training (through Rice County Public Health and the City of Northfield), but stopping short of “hard” infrastructure change. I have two fears. First, the Council will take the County design standards as inviolable and, at best, try to scrape as much accommodation for bicycles and pedestrians as possible under those very limited circumstances/strict constraints. Multi-jurisdictional projects are always more complex, but the Council could ask questions about real safety (rather than just conversation –stopping “safety”) and adapting the standard collector/arterial design to better fit the surrounding land use and community needs. There’s more space for sidewalks than the County standard design suggests, narrowing the street is safe and efficient, and the long-term benefits are great. Second, NIMFYs (Not In My Front Yard) are loud, angry and persistent in Northfield, especially when it comes to sidewalks. In a recent sidewalk issue on Maple Street, Councilmember David Ludescher stated “Citizens know better than we do what they want” so if current property owners don’t want sidewalks, that’s sufficient for deciding the issue against them. Again, as policymakers for the city as a whole, the Council should consider how to build value and equity into the system for the long-term and broader population rather than capitulating to the loudest and most personally interested voices. My hope is the Council will see this project as an important time-limited opportunity to both expand and focus their conversation next week by paying attention to lane widths. Considering the simple change of narrowing travel lanes (without sacrificing safety or traffic flow) could change the broader landscape for the better.